Ballyfarnon is a small village located in the northern part of County Roscommon. Lying close to the border, it has good links into County Sligo and County Leitrim. The village is situated on the River Feorish at the foot of Arigna Mountain and has many popular lakes nearby for the keen fishermen amongst you. The Arigna coal mines that overlook the village are now home to the Arigna Mininig Experience which is well worth a visit. Kilronan Castle, dating from the 19th century, is nearby and is now a luxury hotel and a popular wedding venue. Oil-fired central heating with solid fuel range in kitchen and multi-fuel stove in sitting room. 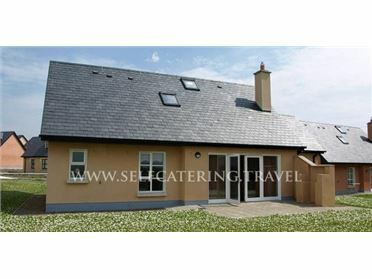 Electric oven and hob, microwave, fridge, washer/dryer, TV with Saorview, WiFi. Fuel, power and starter pack for range and stove inc. in rent. Bed linen and towels inc. in rent. Secured off road parking for 3 cars with CCTV. Storage shed. Sorry, no pets and no smoking. Front lawned garden and side gravelled garden. Shop, pub and restaurant 1 mile. Note: The internal doors are quite low, so care should be taken..